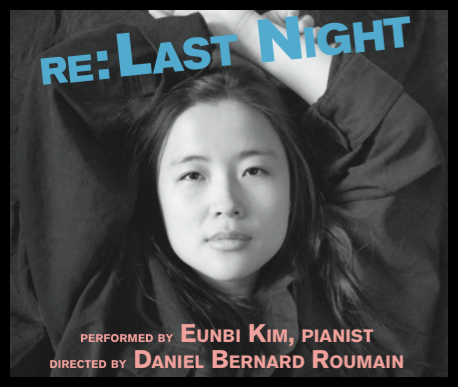 As part of the Open Stage 2015 Season at the Korean Cultural Service New York, re: last night, performed by pianist Eunbi Kim, is a program of classical and contemporary solo piano works. Inspired by the email subject line “re: last night” on a crowded NYC subway, the program is influenced by dreams and delirium. re: last night celebrates these states of “in-between-ness” through a program of left-field music inspired by night and late-night conversations. This program includes contemporary jazz-influenced works from Fred Hersch, William Albright, Nikolai Kapustin, Toby Twining, and the New York premiere of a commissioned work for piano and recorded voices by eminent composer Daniel Bernard Roumain (DBR), who also serves as director for this thought-provoking performance. This performance is the second in a series that follows her evening at the Kennedy Center’s Millennium Stage in Washington, DC, on Valentine’s Day. Kim was born in Seoul, South Korea, and immigrated to the US with her parents when she was 2. She was raised in Maryland and currently resides in New York City, where she received her Masters at Manhattan School of Music. She recently performed her Murakami Music program, her homage to the musical references found in the works of prolific Japanese writer Haruki Murakami, at Symphony Space, Asia Society Texas Center, Georgetown University, and was featured in a special documentary produced by NHK, Japan’s public broadcasting organization. DBR’s acclaimed work as a composer and performer spans more than two decades, and has been commissioned by venerable artists and institutions worldwide. Touted by The New York Times for being “about as omnivorous as a contemporary artist gets,” DBR is perhaps the only composer whose collaborations traverse the worlds of Philip Glass, Bill T. Jones, Savion Glover and Lady Gaga. Known for his signature violin sounds infused with a myriad of electronic and urban music influences, DBR takes his genre-bending music beyond the proscenium. He has been nominated for an EMMY for Outstanding Musical Composition for his work with ESPN; featured as keynote performer at technology conferences; and written large scale, site-specific music for public parks. DBR’s made his Carnegie Hall debut in 2000 with the American Composers Orchestra performing his Harlem Essay for Orchestra, a Whitaker commission. To RSVP to re:last night, please visit the Korean Cultural Service’s website.